David Masip is professor in the Computer Science Multimedia and Telecomunications Dept, Universitat Oberta de Catalunya since February 2007, and since 2015 the director of the UOC Doctoral School . He is the director of the SUNAI (Scene Understanding and Artificial Intelligence) research group. He is member of the BCN Perceptual Computing Lab. He studied Computer Science in the Universitat Autonoma de Barcelona, obtaining a FPI grant in 2001 for starting his PhD degree in the Computer Vision Center (Spain). He obtained the PhD degree in September 2005. 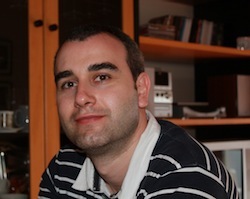 He obtained the best Thesis award on Computer Science in the Universitat Autònoma de Barcelona. Previously, he worked as assistant professor in the Applied Mathematics Department, Universitat de Barcelona, where he was enrolled in the Volume Visualization and Artificial Intelligence group . Currently, he is still a researcher enrolled in the Computer Vision Center. David Masip was a PhD student of Jordi Vitrià in the Computer Vision Center (CVC), Barcelona, Spain. David has co-advised the thesis of Àgata Lapedriza García and Mario Rojas Quiñones. - Facial Expression Analysis and Face Recognition. - Computer Vision and Object Recognition. - Cognitive neuroscience and Vision Research. Open PhD Positions: Check the current call and contact me to prepare the candidature. Open PostDoc Positions: Check the current call and contact me for the interview.